Two officers had stopped a man, later identified as Dashawn McGrier, 26, on Saturday, Baltimore's FOX 45 reported, citing information from police. The officers let McGrier go before approaching him again, the department said. The video was recorded by Dakas White, FOX 45 reported. Baltimore Mayor Catherine Pugh also issued a statement: "I have seen the very disturbing video of an encounter between a Baltimore City Police officer and Baltimore City resident and have demanded answers and accountability. "I am in close contact with interim Commissioner Tuggle who has not only suspended the officer in question but has launched an immediate investigation into the full circumstances of the encounter," the mayor said. Warren Brown, McGrier’s attorney, said his client was treated at a hospital late Saturday for his injuries. Brown said McGrier had previously interacted with the same cop in June, which resulted in McGrier being charged with assaulting the officer, disorderly conduct, and resisting arrest. Brown accused the cop, whom he identified as officer Arthur Williams, of unfairly targeting McGrier in both incidents. The department has not formally identified the officer. 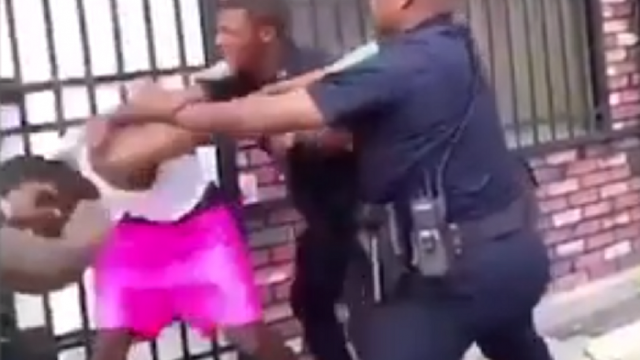 0 Response to "Baltimore cop on paid leave after viral video shows him beating a man"